iPhone SLR lens adapters: doomed to fail? The summary: I don't think that iPhone SLR lens adapters are ever going to work particularly well, based on experience I have building one myself and looking at the design of a commercial one (which, admittedly, I haven't tried working with myself). The adapters have to get around two main problems - 1) fact that the iPhone sensor is tiny and the image that the SLR lens projects at the registration distance is large and 2) light loss. For my own design, I got around 1) by using a magnifier out of a CD player in a similar fashion to the rear element on a set of binoculars to reduce the image size so that a real, but shrunken image is projected more-or-less straight on to the iPhone sensor. I got around 2) by only using one optical element. It didn't really work. The problem mainly boiled down to having used a poor quality intermediate lens, which created a grainy image and chromatic aberration artifacts. 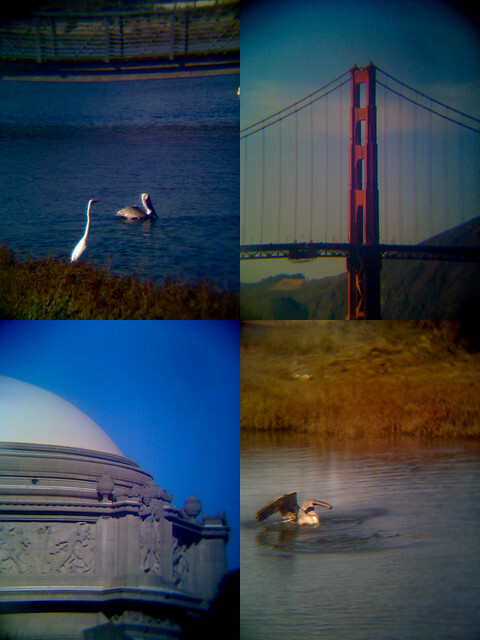 The commercial adapter (manufactured by Turtleback - see: http://turtleback.hk/) approaches the problem differently by projecting the image from the attached SLR lens on to a frosted screen, and having the iPhone focus on that instead. This does work - but the light loss is massive (two stops, at least) and, apparently, the focusing screen gets dirty very easily (see the set of cleaning instructions from the manufacturer here: http://labo.turtleback.hk/archives/2036). Also, the frosted element adds a large amount of grain to the image. It is a better approach - but not by much (or so I think - at this point reiterate that I haven't tried it for myself, so please that that into account as you read this). The adapter-based-approach is a cute idea, but it's essentially doomed by the fact that SLR lenses are complicated optical apparatus that are designed to work with very specific sensors - getting a good quality image out of any iPhone SLR adapter is nearly impossible. I should emphasise that these adapters do work, but only in a limited way - there has to be enough light, and there is an upper limit on the quality of the image that is achievable. If all you want to achieve is shallow depth-of-field, then there are other approaches that produce better results (see below). Without adapters, the fact that the iPhone sensor is super tiny, and it's physically impossible for it to have shallow depth-of-field for anything other than objects that are less than a couple of feet away. If you want to get shallow DOF out of the iPhone, there are a couple of synthetic aperture approaches that might get you most of the way there. For example, see synthcam.